Written with warmth and humour, this book holds something for everyone who is interested in Welsh culture and history. 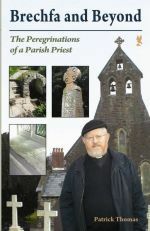 Topics in this collection range from Celtic saints to local characters such as Nancy Caepandy and Twm Penpistyll, from Dafydd ap Gwilym the bard to Ann Griffiths the hymnwriter, and the author's love for the Welsh language. Canon Patrick Thomas was brought up near Welshpool. After University in Cambridge and years of researching in Aberystwyth, he was ordained at St David’s in 1979. He is now vicar of St Peter’s, Carmarthen, and Canon Libarian at St David’s. He has contributed an article to almost every issue of Cambria since Spring 1999. Underneath the gentleness, humour and compassion, Patrick Thomas is perspicacious and penetrating, a voice for today even when speaking about the past. The messages from this delightfully readable book stay in the head and in the heart.